1.) Teams entering this Event can be any combination of men or women, with a total combined skill level limit of 10. 2.) Players may only participate on one team. 3.) Players must be from the same League area. 4.) Players must have at least twenty 8-Ball scores within the last two years by the entry deadline to participate. 5.) Players must be on an active (Spring Session) APA roster in any 8-Ball format in the League area the team represents. 6.) Players cannot be 9-Ball Shootout participants. 8.) Matches are played according to an APA 8-Ball Doubles Championship Handicap Race Chart provided at the Event. 9.) Players alternate shots, not turns. 10.) One coaching time-out per team, per game, is allowed. 4.) Players must have at least twenty 9-Ball scores within the last two years by the entry deadline to participate. 5.) You must be on an active (Spring Session) APA roster in any 9-Ball format in the League area the team represents. 6.) Players cannot be Wheelchair Championship or 8-Ball Classic participants. 7.) Matches are played according to an APA 9-Ball Doubles Championship Handicap Race Chart provided at the Event. 8.) Players alternate shots, not turns. 9.) One coaching time-out per team, per game, is allowed. 1.) Teams entering this Event can only be male/female teams, with a total combined skill level limit of 10. 4.) Players must have at least twenty 8-Ball scores within the last two years to participate. 5.) Matches must be in the standard 8-Ball format, or on a Ladies Division team. 6.) Players must be on an active APA roster in any 8-Ball format in the League area the team represents. 8.) 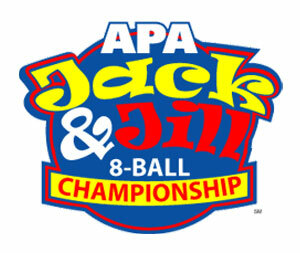 Matches are played according to an APA Jack & Jill Championship Handicap Race Chart provided at the Event. 11.) Matches will not be postponed due to participation in multiple events. Copyright 2005 - 2019, American Poolplayers Association. All Rights Reserved.